Risk adjustment is used in VA by both researchers wishing to adjust for clinical differences in patients and by operations offices wishing to understand the clinical case-mix between programs or sites. Below are answers to some commonly asked VA-specific risk adjustment questions. For more information about the VA Nosos risk adjustment score, see the technical report and our cyber seminar. 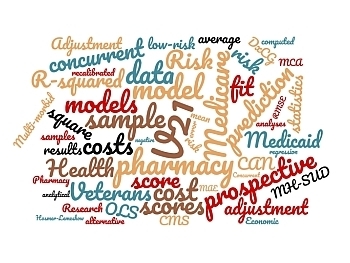 Interested in the VA Care Assessment Need (CAN) risk score? For the CAN report data definitions, see VINCI Central at (Intranet-only: https://vaww.vinci.med.va.gov/VinciCentral/DataSources/Index) > Other Data Sources. For cyber seminars on the CAN score, visit the CIDER cyber seminar database and search for "CAN score". What risk scores are available in VA? How can I access the Nosos risk scores? Where can I find your code for creating the Nosos score? What goes into the VA Nosos risk score? How frequently are Nosos risk scores calculated? Is the Nosos score a concurrent or prospective risk score? What do the Nosos scores mean? Does rurality affect the Nosos score? Does population size affect my site or program’s Nosos scores? How did the transition to ICD-10-CM affect risk scores? How can I improve a patient’s Nosos score in my site/program? Is there an HCC risk calculator for VA? Risk adjustment is one way of adjusting for inherent differences in patients' underlying clinical needs. Many risk adjustment techniques have been developed, some using proprietary methods and others public. In general, risk adjustment techniques use clinical information on patients, such as their diagnoses in the form of International Classification of Diseases (ICD-9 or ICD-10), to classify them into homogeneous clinical categories. Examples of risk adjustment methods include the DxCG from Verisk, the Charlson comorbidity index, the VA Care Assessment Need (CAN) score, the SF-46, the 3M Clinical Risk Grouper (CRG), the UC San Diego Chronic Illness and Disability Payment System (CDPS), and the Centers for Medicare and Medicaid Services (CMS) V21 & V22. The most commonly used risk scores in VA are the CAN and Nosos risk scores. CAN was designed to predict hospitalization and mortality. Nosos was designed to predict costs. The Nosos risk scores are stored in the VA Corporate Data Warehouse. Access information is available on the VHA Data Portal on the VA intranet at http://vaww.vhadataportal.med.va.gov/DataSources/HERCCostData.aspx#V21andNososRiskScoresData. The code for creating the Nosos score is maintained on the Corporate Data Warehouse (CDW) in an access restricted account. That said, the intuition behind the model is simple and we’re happy to explain it. The Nosos risk score is based on the CMS V21/V22 risk score. You can obtain the code and additional information on the V21/V22 risk score from the CMS website at https://www.cms.gov/Medicare/Health-Plans/MedicareAdvtgSpecRateStats/Risk-Adjustors.html. The Nosos risk score is calculated based on the entire fiscal year (FY) and is based on VA data only. Nosos uses diagnosis data (ICD-9 or ICD-10) from the VA Patient Treatment File (PTF) and the National Patient Care Database (NPCD), commonly known as the MedSAS inpatient and outpatient files. Diagnoses are those from the encounter or stay; we do not pull diagnostic information from the patient’s problem list in the electronic medical record. Nosos also includes demographic information, including gender and date of birth, from the VA Vital Status File. To tailor the risk score to VA, Nosos includes mental health and substance abuse disorder diagnoses from the PTF/NPCD mapped to the Psychiatric Case-Mix System (PsyCMS; technical report on PsyCMS for ICD-10-CM) for mental health indicators, drug prescription data from the MCA pharmacy extract mapped to the 25 VA drug class categories, utilization costs from the MCA files (in the categories of total MCA cost, MCA pharmacy cost and Fee Basis cost), and additional demographic information. Additional demographic information includes additional insurance coverage, race, marital status, VA priority (priority 1-9), and inclusion in a VA registry (from the VA Allocation Resource Center). Nosos risk scores are calculated for each fiscal year (FY). Nosos risk scores use the diagnostic and demographic information from the entire year to generate both hierarchical condition categories (HCCs) and risk scores. We calculate Nosos risk scores as both concurrent risk scores (use the variable: nosos_c) and prospective risk scores (use the variable: nosos_p). Concurrent risk scores use current year data to predict the current year risk score. Prospective risk scores use current year data to predict future year risk scores. For example, if you use FY2017 data to predict the FY2017 risk score, you are calculating a concurrent risk score; if you use FY2017 data to predict the FY2018 risk score, you are calculating a prospective risk score. The Nosos scores are centered around 1. A value of 1 means that the Veteran is expected to have costs that are the national average for VA patients. If a patient has a risk score of 2.5, then a patient has an expected cost that is 2.5 higher than the average VA patient. Rurality of patients does not affect the Nosos score directly, as there is no rurality indicator within Nosos. However, rurality could indirectly affect their Nosos risk score. For example, if a patient uses more non-VA care such as Medicare or Medicaid, this does not get captured in the Nosos score. This means that a rural patient who minimally uses VA services may have a lower risk score because Nosos does not have the complete picture (e.g., we are missing diagnoses and cost from any non-VA provider). The size of the population does matter in terms of statistical averages, but the population size does not affect an individual’s risk score. Smaller populations are affected more by outliers than larger populations. To see how this might affect your site or program, look at the average score and the median score for your site or program. This should give you some information on the distribution of scores. Our initial concern was that coding was going to drop after the initiation of ICD-10-CM coding. However, the coding in general looks consistent with the ICD-9-CM coding. There are some secondary codes that are not being used frequently. See the Yoon and Chow (2017) article “Comparing chronic condition rates using ICD-9 and ICD-10 in VA patients FY2014-2016” at https://bmchealthservres.biomedcentral.com/articles/10.1186/s12913-017-2504-9. We also had to update the PsyCMS risk scores to reflect the ICD-10-CM codes (see Technical Report 31 for more information). Because Nosos risk scores are based on diagnostic and demographic observational data from patients’ VA medical records, it is not possible for a site to easily change a risk score. Nosos uses all of the diagnosis information within the 12-month fiscal year to compute the hierarchical condition categories (HCCs). The diagnostic information is combined in a non-linear fashion, along with the demographic information. The Nosos score was designed to reflect the patient’s underlying illnesses and was designed to be relatively unaffected by small changes in diagnostic coding. If there is a concern about patients being under coded or assessed at a lower risk score, you can consider the provider’s underlying coding. Providers should be coding for all conditions with which a patient presents. Additionally, providers should ensure that their coding covers all conditions across the patient’s spectrum of chronic conditions, rather than coding for only one condition. For example, if a patient has a non-curable chronic condition, such as epilepsy, that is first coded in FY2013 but is not recorded again in FY2014 or FY2015, it could cause their FY2014 and FY2015 risk scores would be lower than in FY2013 because epilepsy is not showing up in the diagnostic information for FY2014 or FY2015. There is no dashboard or risk calculator for VA patients. For each patient for each fiscal year, the Nosos HCCs are populated and recorded in the fiscal year files. See the VHA Data Portal for more information about requesting operational or research access to the Nosos risk score data.